1) The way energy works in the campaign has changed. Battles nodes now got you zero energy until you have passed it for the first time, whether that takes one battle or 20. Energy is now only used as a balancer when grinding gold from passed battle nodes and for reward nodes like the chests, etc. 2) The Steam client has been improved to better handle different monitor resolutions. Widescreen monitors will now maximize their use of space and display chat at all times. 3) Creatures that destroy themselves (ex. Grizzle Beast) will no longer be prevented from doing so if they are Indestructible. 4) Elara will no longer be affected by the cards Flesh Seeker and Essence Shift and Amarus' Twisted Bond ability. 5) Effects and steal HP will no longer grant HP if the HP is not reduced on the target (example: Abbadon's Drain Life on Elara). 6) The volume of the sound effects and music has been refined in the game to provide a better audio mix. New sound effects and music will be coming soon! Elara's rules text prevent her from losing HP from abilities and effects that say "Lose X HP" (including "Steal X HP"). It does not prevent abilities that permanently change her HP, such as the spell "Inner Fire" which reads "Target creature gets +1 ATK -1 HP". Today we released a very small update to fix the bug with the card "Mug". The card was crashing games, and leading to unearned wins. If on your main screen you see the version number 1.3.2, you have the right version and Mug will not give you an error. A new Steam build has also been deployed. In the near future we will be deep diving into the error handling code to try to avoid this from happening altogether. Games should not be decided on errors. In the case of Mug, the code should have simply ignored the card and not played it, allowing the game to continue. Kingdoms CCG is a game of skill and matches should be won on skill - this is very important to us. As announced in last week's KCCG Radio Podcast, we are creating a Watch List for cards in Kingdoms CCG. The Watch List contains cards that have been raised by the community and our Beta testers as potentially needing a change to reduce their power (a nerf). Our goal with the Watch List is to make this process and our current thinking as transparent as possible, so that no one is taken off-guard when a change occurs, and to help further the discussion of these cards. The potential nerfs listed are those that are considered by us to be potential solutions. Not all would be applied, we are just presenting the options. Please note that just because a card is on this list, does not in any way mean that it will be nerfed. The card has just raised the concern of the community and is being watched by Ganz. We will be updating this list periodically. Concern: That it creates board states, usually combined with Fae Paragon, on Turn 1 that are nearly impossible to beat. Our Position: Raise the Guard was specifically designed to give low mana creature decks added strength and reach. As an Epic, it should provide value. Unlike Exalted Enforcements, RtG forces you to build your deck around the card, with enough targets to make it work, and as the number of targets increase the randomness of the card also increases. Note that Indestructible has already been removed from the card. Potential Nerf(s): Increase cost to 7. Make removal of Indestructible permanent. Limit creatures found to the Holy kingdom. Concern: Does too much for a 3 drop. May be reason Raise the Guard seems broken. Our Position: Fae Paragon originally started as a 1/2, but was raised to 2/2. We like the basic power level of the Paragon, but with the stacking resist and Raise the Guard, multiple Paragons can become too difficult to remove. Potential Nerf(s): No longer award Resist to other Fairies, to make them a little less resilient to removal. Concern: Too powerful for a rare as both a powerful attacker and a high utility creature. Our Position: I have written my position on this card here. In hindsight the card likely should have been Epic. Potential Nerf(s): Reduce ATK to 2. Reduce Charge Drain to 2. Status: Continue observing, with specific focus on the Limited Environment. Nerf is possible. Concern: While not game breaker, the power level of this card seems high for an uncommon. Manacycle is a very difficult ability to balance. Our Position: As stated, the only concern with this card is the amount of Manacycle, which allows it to do too much for free. Potential Nerf(s): Reduce Manacycle to 1. Concern: Stealing a full set of charges can lead to a state of "the game's over, you just don't know it yet." Interaction with Concealed Dagger is particularly troubling. Our Position: Definitely an over-powered card, and a back-breaker when it hits. Bleed is now available to limit its effect, and the card has been seen less in tournament results lately. Potential Nerf(s): Limit charge steal to a specific amount (5). Make award charges at end of turn, not immediately. Concern: Despite the recent limiting of this card, it remains the most powerful pump spell in the game, overpowering its Epic counterparts. Card's interaction with Haste doesn't make sense. 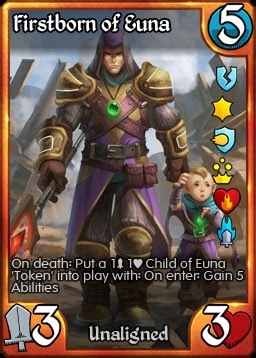 Our position: Scrollmaker has added to the issue with this card. The initial nerf has had little to no effect on the card's impact. Potential Nerf(s): Increase cost to 3. Status: Continue observing. Fixing interaction with Haste is likely. We encourage players to join the discussion on these and other cards in our official forums. If you just started playing, or missed your chance to get the Firstborn of Euna back in December, we're running a special event this weekend to get your copy FREE. Just log in between Feb. 7-8, 2015* and you will be granted your free copy of this powerful Legendary creature**. The card will only be awarded once per account, so if you have already received a copy, you will not receive another (so please, don't scrap yours thinking you'll get another). * Kingdoms CCG runs on GMT. Please plan accordingly. Play on Saturday to ensure that you get your card. ** Some players do not see the card immediately in their collection after seeing the message. Simply log out and back in again and your card will be there.